Rural fares increase by 5p or 10p. Evening flat fares remain unaltered, but will also apply all day on Sundays. The Busabout ticket is also increasing from �2.00 to �2.20 - the first time it has gone up in nearly 10 years!! Most weekly tickets increase by 50p. Reading Buses Optare MetroRider Mk 2 has been sold to Charlton Services who operate service 108 in Oxford. It is currently still in Reading base livery with parts of the green stripe in tact, but fleet names and numbers have been removed. It also appears to have both it's Reading numeral and destination blinds in tact - presumably this operator being not too far away will be able to make use of the rural destinations included on Reading blinds. So far though all I can confirm as having been used are 108 and Town Centre. City Sightseeing acquired fellow tour operator Guide Friday yesterday afternoon. Guide Friday will continue as a separate company for the moment, but it seems likely that some changes to the tours may well occur in the future because both companies operate a number of tours in the same locations. Bus operations in Stratford are apparently going to operate under the Stratford Blue brand. Thanks to Richard Sharman and David McGow for this breaking news. First in Berkshire have ordered eight new Mercedes Benz Citaro buses to operate services 74/75/76 from Wycombe and Slough to Heathrow Airport from September. (Click here for a photo of a Citaro operated by Warwickshire based Johnsons Coaches). Citaros have also been recently ordered by the Oxford Bus Company to operate the new fifth park and ride service. Stagecoach in Warwickshire have announced that their services in Coventry will cease to use Pool Meadow Bus Station from 8th June. This is most likely due to the Phoenix Project for city centre redevelopment, and other operators are likely to follow suit in the near future. A large number of coaches again visited the university today for one of it's open days. Over 20 coaches were present, including some from the Oxfordshire region - two from Motts Travel, and another from Worths. A surprise appearance was made by Coventry's Travel West Midlands Golden Jubilee liveried Dennis Trident, 4223. It has yet to be used in service since it was repainted, only having been used on couple of private hires, but today it was used on a special fare paying service to Coventry Railway Station during the afternoon to help cope with the crowds of people wanting to get home at the same time. Left shows a line up of most of the coaches that were visiting the university today, they are in the Westwood Games Hall car park which was specially closed to make way for them. Right is Golden Jubilee Trident 4223. 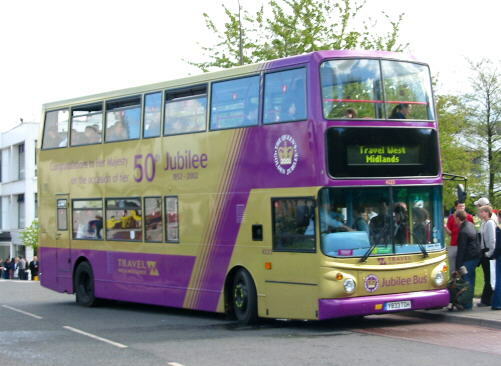 In Reading, the Reading Buses Golden Jubilee bus was seen in service for the first time today. The bus wears a special adaptation of the company's LowRider branding - JubileeRider. This photo was taken by James Cusworth. The prize for the best journey went to TWM's Lynx 1299, it was a piece of luck that I managed to catch it and to my pleasure I found that this Lynx was everything that a good Lynx should be. Very smart and very quick! The Volvo to and from Stratford was also one of the better examples of the type that I have travelled on, I had my first ride on a B6 in Rugby and finally I managed a ride on a Leyland National after a long gap since the type were withdrawn by Newbury Buses. I saw a number of interesting vehicles too, including all four exReading MetroRiders that are now with Guide Friday (611 being in Cambridge livery), Guide Friday's rebodied single deck Atlantian and a number of Stagecoach in Warwickshire vehicles that I hadn't seen before in Rugby. Chiltern Queens of Woodcote were sold to Horseman from Saturday 13th. The coaching side of the business is to be merged into the Horseman business, and the bus side developed into a true "Village bus" network. They will continue to use the CQ depot in Woodcote, but the current Horseman depot by the motorway is under the threat of redevelopment in connection with the motorway junction and so things may have to change at some point. Thanks to Mac Head for this news. London Tour Buses visit Reading! At least five Arriva London tour buses were operating in Reading today on rail replacement services. Reading Buses provided a substantial fleet, including 17, 68, 72, 75, 83, 85, 86, 456, 460, 461, 468 and 703. The five tour buses that I noted were closed top MCW Metrobus Mk1s, registrations GYE 399W, GYE 530Y, KYV 659X, KYV 710X and KYV 746X. Four of them were actually sighted at the same time at the station at around 7pm, three being line up behind each other and the fourth opposite, and thus providing something quite interesting to look at! Reading Buses also provided an inspector for the entire day to monitor the buses and to get them to load up and depart at the right times. At times the bus stops at the station got very cramped with such a large number of extra vehicles needing somewhere stop, but the inspectors ensured that everything was managed very well indeed and congestion was kept to an absolute minimum. GYE 539W, KYV 710X and KYV 746X at around 7pm today. Admittedly I did cheat a little by doing a bit in car, but I could have just as easily used the bus to get back to Wycombe. For the Arriva journeys I purchased a one day explorer ticket for �6, but I wasn't overly impressed by the Lynxes allocated to and from Reading. They did make a change however because I don't very often get the chance to travel on Lynxes, and they did make an interesting comparison with the Travel West Midlands examples. The West Midlands also play a part in the Woottens fleet in the form of Daimler Fleetline KON 323P. The Fleetline is a former West Midlands Travel vehicle and is being preserved by Mike Wootten and such it acts as a spare for when the VR is out of service, I was pleased to be able to have a brief ride round on it! WJI 2849, KON 323P and ABW 310X in the Woottens yard. Keith Wood has written with details of four recent deliveries to Mike DeCourcey Travel, mainly to operate the recently won route 555 contract. The vehicles are ex Stagecoach Mercedes Benz / Alexander AM Sprints N451 VOD, N453 VOD, N464 VOD, N468 VOD and are in Rural Rider livery. The First in London website www.firstcapital.co.uk has announced that First London became responsible for First in Berkshire (formerly First BeeLine) from 1st April, First in Berkshire previously being part of the South and Wales division. The Reading Transport Travelshop is moving from Duke Street to Church House in Chain Street on the corner of the path by St. Marys church and John Lewis. The new site will be known as the "Reading Visitor Centre and Travel Shop" and will offer all of the facilities previously offered by the Travel Shop, plus those previously offered by the Reading town hall information centre. You will be able to purchase Reading Buses Travelcards, book Goldline Travel excursions and enquire about bus services just as before plus National Express tickets, "Whats on" information, travel advise and local information will also be available from this more central site. The first of the new low floor Spectras for the ordinary Reading fleet has now been noted in service. Five in total will eventually join the fleet and will have LowRider logos similar to those applied to Reading's Excels. Spectra 722 was seen today operating route 17 (see photo), it having arrived back from repaint out of DayTrack/NightTrack livery. It is believed 721-3 are all to be repainted into LowRider livery (721 was noted back in Reading incorrectly repainted into standard Reading colours, and so it has had to go away again for rectification). The final two new deliveries are also to wear town livery and are due to arrive soon. It is expected that these will become 724-5. The final NightTrack Spectra, 739 has also entered service this week. Thanks to James Cusworth for the news on 722, 739 and the photo. First in Hampshire "Bendi-bus" Y147 ROT was on loan to First in Berkshire from 7th March to 16th March, and was used during peak periods on the Reading Madjeski stadium park and ride service each day from Monday 11th to Friday 15th March. The bus was reportedly on loan so that the company could assess whether or not to place order similar buses for use in the area. The vehicle was a Volvo B7LA with Wright bodywork, and Dennis Dart 211 was sent to Hampshire to cover. The weather for the day turned out to be quite poor, which lead to the decision to spend less time in each location and make full use of the Stagecoach Explorer ticket that I purchased for �5.50. I wasn't expecting to end up having a trip to Warwick and back. However in the end it meant that I used all of the main trunk routes operated from Leamington - to Stratford, Coventry, Warwick and Warwick University. The final journey back to Leamington wasn't really part of my day out - it was to allow me to catch a train back to Reading! In Stratford I caught up with former Reading Optare MetroRiders 610, 612 and 613 now working for Guide Friday. Sadly I didn't see 611 so I will have to hope that it turns up on my next visit to the town. Guide Friday and City Sightseeing were both operating open top tour buses, Guide Friday I think using Leyland Atlanteans and City Sightseeing Mk 1 MCW Metrobuses. From Guide Friday I also noted single deck Atlantian KUI 2269 and one of the two Warwickshire County Council owned Mercedes Citaros that they operate, along with one of the other two that Johnsons operate. My brief visit to Pool Meadow was to allow me to travel by bus into Coventry the quick way along the Kenilworth Road. It made an interesting change from going through the University and half of Coventry on TWM's route 12. The trips on the Volvos were interesting, probably the most notable was that on 219 which showed the great range of things that bus drivers have to cope with. Two quite young mums with buggies got on the bus in Stratford to travel down the road because it raining. The driver let them get on without folding up their buggies as if it were a low floor vehicle. They pulled the buggies up the stairs and got on OK. One of them was saying to the other how it was the first time they had been on a bus in 10 years, and then were sitting watching the world go by when on suddenly one looked up with a very shocked look on her face - "Oh, I wanted that stop", expecting the bus to stop without ringing the bell, getting up or saying anything to the driver. Anyway the driver kindly drew up and let them off before continuing the journey. On the way the bus picked up two groups of American tourists wanting Warwick and Warwick Castle respectively. The driver was very helpful and said that he would let them know exactly when to get off, and had to keep on reassuring them as the ones for the Castle started talking loudly with the other group that they had discovered came from the same city as them about not knowing if they had been past the stop yet or not. Anyway they were all safely delivered to their destinations. Then on into Kenilworth and a silly motorist at a three way junction shot around the corner right in front of the bus which had slowed right down for this tight right corner, but still had right of way. The driver handled the situation well breaking hard to avoid hitting anything. Further on two parents with two kids got on, the father with the baby strapped to his chest and whilst watching the second child fumbled for some money. The mum dragged the buggy on board and went to sit down with the older kid after having a discussion with the father about where to sit. The father moved out of the way to let the mum on and just stands there until they are out of the way before fumbling a bit more, moving the buggy about in the luggage pen and sitting down to find some cash. Meanwhile the bus is sitting in the middle of the road with the driver waiting patiently. Eventually the driver says "We can't stay here all day..." just as the father finds some money to pay. Sadly the driver let himself down on the way into Coventry when he started smoking with the passengers still on board the bus, not something that I see very often at all, and don't expect to either. In Leamington the two coaches 8 and 10 that are used on a Chiltern Trains contract were sitting at the front of the depot, looking to have been in service, but still in plain white rather than a special livery. The visit to Warwick allowed my first use of route 66 (and 76) which runs every 10 minutes through the Woodloes estate to the historic town. Whilst I didn't find much to look at in Warwick I enjoyed the trip on Solo 609 quite a lot, it was probably the best ride of the whole day. The rain held off, the seats were very comfortable and the windows weren't steamed too much like all the buses that I had been on up until that point. Whilst the Volvo B10s are pretty good vehicles I wasn't overly impressed by them, I was surprised when one started leaking water from the roof. All of the Stagecoach vehicles were however well presented, and the dirtiest interiors were on the TWM vehicles, even their on their new Tridents. The most jerky bus was the Mercedes/Alexander Sprint on the 76 which has a manual gearbox. 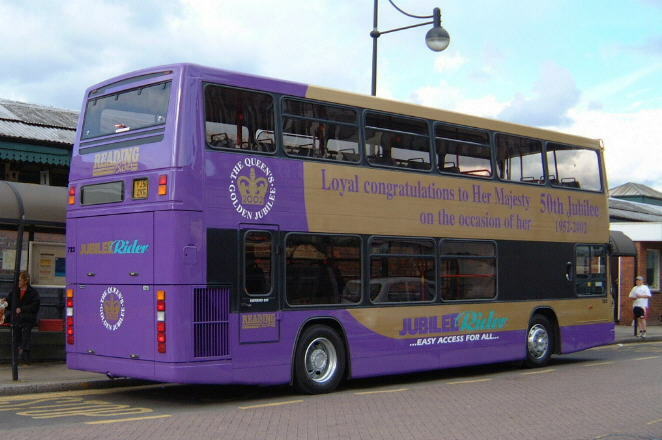 It has become known that one of the former Reading Mainline Routemasters is to become one of 51 buses in London to be painted gold for the Queen's Golden Jubilee celebrations. The vehicle involved is No.37 (RM1650), and is said to be the only surviving Routemaster from the 25 that were painted silver for the Silver Jubilee in 1977, during which time it was known as SRM3. It should however be noted that due to overhaul work carried out by London Transport on Routemasters the actual body being carried on RM1650 in 1977 was a different one to that it carries now. The present body was from RM1864 after overhaul in 1981, and so the body that RM1650 has now technically did not carry Silver Jubilee livery. The continuing driver shortage at Reading Buses has caused them to announce some temporary service cuts starting sometime in March to help them restore reliability to their network. Services 1, 1A and 21 are to be cut in a bid to reduce the driver deficit, currently said to be around 28 even after a long and high profile recruitment program. Cuts were made to minibus services back in November 2000, which the company have also not been able to restore. The round's services have been chosen because a large proportion of the areas they cover have alternative services running from a reasonably short distance away, and also because they the don't run that often. However from my estimates I know service 21 uses two buses, and consequently needs 5 drivers to operate, and the 1/1A also uses about 5 buses and so another 10 drivers are saved there, which means the company saves around 15 drivers, even though they are relatively infrequent. It is however sad to see these services go because they do serve a number of communities in a way no other services do, and it will mean people having to walk further to get a bus. Enthusiasts will note that the loss of route 1/1A will leave a number of Optare Solos spare, and so we may soon be seeing the last MetroRiders leaving the Reading fleet, or at least them going into store for a while. Also all three services were started in response to or as a result of operations by Reading Mainline, in fact once these services have gone the only remaining impact of Mainline on Reading's bus network will be services 13 and 31. Ray Jarvis informs me that the last of the eight Eastbourne Optare Spectras was delivered to Reading Buses today, and that now only two of Reading's Excels have yet to make the return journey. This now takes Reading's fleet of ordinary step entrance Spectras to 15, and fleet of Excels down to 54 (+2 soon to depart). Ray also tells me that the first Excel to be repainted by Eastbourne is former 956, it going into a ColourBus livery for a local Vauxhall dealership. There are still about half of the 14 brand new low floor Spectras to be delivered from Optare, all of the ones that have arrived so far are in Night/DayTrack livery. Tuesday 29th January saw Stagecoach in Warwickshire Solo 615 out on the usually double deck X12 route from Leamington Spa to the University of Warwick. It hasn't been unknown for a Solo to get on to the route in the past, but even so workings like this are rare, so I decided to take the opportunity to go for a ride. On of the main differences about the X12 to other routes in the area is that it uses the A46 dual-carriageway for part of the journey, providing a chance to see how the company's buses, usually double deckers perform at high speed. The usual Volvo Olympians perform very well, and maintain a decent top speed with ease. The Solo also gave a very good performance, although you could tell that there was a speed limiter fitted because it felt as if it wouldn't have preferred to go faster than it actually was doing. When it reached the set limit the engine would rev as normal and then rest for a second before revving up again, creating a few jerks. The driver soon realising this eased off the accelerator very slightly so that a constant speed just below the limit was met and the ride was very smooth. The quality of the Solos is also very good, the seats were comfortable, and although appearing to be of a similar make and style to the ones fitted to TWM's new Dennis Tridents in the area, they didn't feel it because they were much softer. One thing that I noticed when comparing them to the Solos used by Reading Transport was some of the noises they made. The Stagecoach ones frequently made quite metallic sounds, a bit like a garden gate opening, but I have never experienced this on the few Solos I have sampled in Reading and Newbury. Still the sound wasn't an unhealthy one at all, and in a way made the buses sound very high-tech and special. Overall, a very nice vehicle, and a good ride. First of all a slightly late happy new year to everyone! In Warwickshire the first of the ex-London Volvo Olympians with Northern Counties Palatine 1 bodywork have started to arrive. P527 HMP was noted operating from Leamington on Tuesday 8th January, and has been given fleet number 928. The fleet number, company logos and legal details have all yet to be applied to the bus, and it seems that the bus is also unable to display a route number until better blinds are fitted. In Newbury the order for three Optare Solos has been increased to four, the first three are for services 6 and 9 to Newbury, and the additional one will be longer than the other three, but it is not yet known what route it will be for. They will replace three to four MetroRiders, which means the end of the Mk2 MetroRider in Newbury could be near! From Coventry to Reading - By Bus! The first stretch of my journey wasn't anything special as it is the route that I use to get to university every day. The Trident was however the newest bus that I travelled on all day. For the Leamington - Stratford section I had planned to catch the 1002-1037 X16, but the X18 turned up late at 1000 and so I decided to catch it instead. I had a nice ride through Warwick and the bus caught a few minutes up driving through the countryside before arriving in Stratford at about 1050. The only other late bus was the 32A from Oxford, it arrived at St. Algates in Oxford 7 or 8 minutes late, and got to Didcot only 5 minutes late. In a way this was a blessing as there really wasn't much going on there! The Didcot wait probably contained the fewest buses, but then I wasn't actually in the town centre, but at Didcot Parkway rail station. I did get photos of a couple of Thames Travel buses that I had been wanting however, which was good. I have missed from here my wait in Stratford and then the bus from there to Oxford. The wait in Stratford proved to be the best one of the day with a number of interesting buses to photograph, and a little surprise. I found recently sold Reading MetroRider 612 there working for Guide Friday in the only town in the country where they operate a bus service as well as open-top tours! Not only had I forgotten about this operation, but I had no idea that 612 was there working for them! Anyway the ride from Stratford was very nice although the bus seemed very under utilised, it seemed to me that a minibus would have sufficed to carry the load at that time of day. It was quite strange being on a double decker bus with double doors again, Reading removed all of theirs a couple of years ago, and there don't seem to be any in Warwickshire or the Midlands otherwise. In Oxford I caught up on the scene there, but failed to get a photo of the new Stagecoach MAN 18.220 / Alexander ALX300s that I had been hoping to get. Back in Didcot the Newbury Bus turned up with only a minute to spare before setting off again, with me on it, back to Newbury. This was the only service where I was the only passenger for a good proportion of the journey although quite a few people did use the service at the Didcot end. Surprisingly the Solo was the only mini bus that I travelled on for the whole day, and I had a good ride around the countryside on it. As the second newest bus I found the seating on it much more comfortable that on the TWM Trident in the morning, the extra width of the seats contributing to this rather than there being any extra padding. During my brief period in Newbury I noted one of Weavaway's ex-Hong Kong 107 seat MCW Metrobuses, which have now gained special "Weavaway Megadecker" branding to that effect. Sadly however it had become too dark for photos. Finally my last bus of the day turned out to be what I had been hoping for, a Metrobus, but sadly it turned out to be my least favourite bus of the day - it was freezing up on the top deck where I sat. The total cost of the day's journey came to �10.50, this was �5.50 for a Stagecoach Explorer ticket and �5 for a Reading/Newbury Buses Busabout, both proving great value for money - the Stagecoach ticket is even valid on their services in Birmingham! I had a TWM bus pass that I used for the first part of the journey, which if I hadn't of had the fare would have been �1.30. However instead of paying �1.30 I could have caught a bus into Coventry City Centre for 80p and then caught the X18 from there. A quick look at the automatic ticket at Leamington Railway Station told me that the train fare from Leamington to Reading would have been �19, so in all I saved �.8.50, but spent about 6 hours longer travelling, and then there is the cost of catching a bus to and from the stations, 80p and 60p. But I thought those extra hours were well worth it because I had lots of breaks in the journey and a chance to look around a number of interesting places. A check on the Internet showed that by coach it would take about 2 hours longer than the train (4 four hours less than the buses) and it would have cost �13, or �9.50 if I used my student card, plus I would have to pay the bus fare to and from the pickup points, 80p and �1.05. No doubt the coach journey would have been the least enjoyable, mostly being via motorway, plus I would have had to change coach at Heathrow Airport. The following day I took a trip into Reading to catch up on the bus scene there. The new DayTrack service 51 was in full swing and I was very impressed by the buses new and not so new that were operating it. Especially impressive were the dot matrix displays on the new Spectras, which rather being so dull you couldn't read them, they are really, really bright! Also full destination and via information is shown on the rears of these buses, a first for Reading, and probably many other places. It is not very often that you see full via information as on the front of the bus on the back as well! On the side the number and ultimate destination is displayed. The interior of the buses appears very smart as well in the usual Reading LowRider style, but with additional scrolling dot-matrix information screens! Very impressive. I hope to put some of the photos from my journey and later in Reading on the site in the coming weeks, especially the one of 612 with it's new owner in Stratford and the ones of the new Spectras! MCW Metrobus 193 has been painted up into a special commemorative livery for Reading Buses' 100th anniversary. The livery is essentially Reading Corporation Transport's red livery with three cream bands, with special adverts on the side to advertise the passing of the event. It also seems that the bus has had all of it's seating re-upholstered! Overall the bus looks very good indeed, and there has been some attention to detail with the bus regaining it's MCW and Metrobus badges on the front and rear respectively which it (and all of it's sisters) lost a number of years ago. A number of rail replacement services have been operating over the last few weeks in Reading. However this weekend saw works in the two main areas covered by this site - Reading and Coventry, and on the weekend I was travelling between both! Luckily my travel wasn't disrupted - the replacements in Reading for the Newbury line with trains terminating at Reading West and Buses providing a shuttle service from there to the station. Noted on these services on Saturday 24th were two of Carousel Buses' Metrobuses, Weavaway's VanHool Alizee B10M TT, and Reading's 84 and 190. As far as I could tell trains weren't stopping at Coventry or Birmingham International (at least not from Reading), and replacement buses were provided from Leamington to Birmingham via Coventry (although I only noted coaches when I was there at about 7pm!). After getting off my train in Leamington I was able to catch an X12 to the uni and then a 12 back to my house in Coventry rather than messing about with all the coaches which wouldn't stop near my house. Even at 7pm three coaches were present, all from different companies. I have no idea what it was like during the day! Finally I noted a Motts coaches sitting outside Banbury station, being on the train I couldn't get any details, but I presumed it to be on rail replacements also. Spectras have been arriving in Reading from Optare and Eastbourne. New Spectra 722 is YJ51 ZVF. Ex-Eastbourne 712/3 arrived in NightTrack livery to cover for the remainder of the new Spectras which are due in the new year. Meanwhile has arrived in Reading, presumably for the town fleet. I have a photo of 712 on the Reading Spectra page. Excels 951-3 have all now left the fleet, and all have apparently entered service in Eastbourne without Reading Buses logos, but otherwise in full LowRider livery. On the NightTrack front, large posters have been put up on most of the bus shelters in town to advertise the new service, and service numbers have been put on bus stops. A few other alterations are taking place from the same date. A number of existing evening are being withdrawn or re-timed to co-ordinate with the the NightTrack services, and also rural routes 105, 106, being withdrawn, and the 328, 330 and 331 are being transferred to Arriva the shires & Essex. Yet more Spectras for Reading! Reading Buses are swapping 10 of their Optare Excel LowRiders for 6 Optare Spectra double deckers from Eastbourne buses. The Excels to be sent are 951-60, which themselves were only purchased just over a year ago from Cardiff Bus. The Spectras being received are Eastbourne's 76-81 (S876-81 BYJ) and will become Reading's 708-13. The first (S880 or S881) arrived on the 8th in full Reading Buses livery, having been repainted at Eastbourne. These Spectras have steps in the entrance like Reading's existing examples, but unlike them are to low height specification and also have a different seating layout. Along with Reading's order for 14 new low floor Spectras these buses will bring the company's fleet of the type upto 29, with all three of the different versions represented! It is interesting to note that Reading Buses, Eastbourne Buses and Cardiff Bus are all council owned bus operations, there only being eighteen such operators in the entire country. From Reading's existing fleet of Spectras 706 has been painted into the new NightTrack/DayTrack livery ready for the start of the new services on the 25th. It is one of a possible three to be repainted to cover for the new Spectras which won't all arrive before the new services are due to commence. The final delivery date for the last of the new Spectras (these presumably being the ones for the town fleet) is said to be March 2002. Five of the new Spectas are due to arrive very soon, one of them is known to be YJ51 ZVE. Full details on the Eastbourne Buses fleet can be found on the company's website. Reading's Mk 1 Optare MetroRider 609 has been given a new lease of life as is to be used as a youth community bus in the West Berkshire area. In a project funded by John O'Gaunt School and Hungerford/West Berkshire County Council the bus is to receive a new interior to display items from the region that are of interest to teenagers. The bus will wear a special yellow and blue livery and as part of the deal it will be maintained by Newbury Buses depot for a year once the bus has been made ready at the Great Knollys Street depot in Reading. 609 was the last Mk1 MetroRider remaining in the fleet. For more details and a photo see the Reading MetroRiders page. Thanks to Paul Hilton and the Newbury Bus Club for this information. Today is Reading Buses' 100th birthday, the company having been founded this very day 100 years ago. Initially known as Reading Corporation Tramways the company has evolved into the modern day Reading Transport which owns Reading Buses, Newbury Buses and Goldline Travel. A special page has been created on this site for the event, briefly looking at the company's long history with some very interesting photographs, including the first ever photo on this site of a Reading Tram! (Many thanks to Andy Crump for supplying this!) It is hoped that the new page will cover any special events to celebrate the centenary that may take place in the coming months. Another round of large scale service alterations took place in Newbury this week, starting from Monday 29th October. This time the changes see quite a few new services for Newbury Buses, replacing some of their existing services numbered over 100 and partially replacing services previously operated by Stagecoach Oxford. The remainder of the changes seem to be a few tweaks that were needed after the last lot of changes exactly six months ago. The three new Solos which are on order will now be used to operate services 6 and 9 which replace the 131, and also on the 4 and 5 which will temporarily have only a partial Solo service until the new Solos arrive to cover the rest of the duties. Full details are on the Reading & Newbury Bus Routes page (as opposed to the official Reading Buses website which as yet makes no mention) or you can telephone Traveline on 0870 608 2 608. Obviously already in need of a holiday, Stagecoach in Warwickshire Optare Solo 613 was loaned to Stagecoach Devon last weekend. It was noted at Exeter Tescos on 22/10/01 with Mini Pointer Dart 202 (WA51OSF) presumably for comparative trials. It returned on Monday 29th. Two Solos out of the group order for 50 are on order for Stagecoach Devon. Thanks to www.devonbus.co.uk for this snippet, and also James Cusworth for pointing me to the site! Reading Buses have placed an order for 14 new low floor Optare Spectra double deckers. Nine will be for the new council tendered NightTrack/DayTrack contract services (see article from 13-09-01 below), and will wear a special livery of dark blue and white with starts along a diagonal in-between the colours in the middle of the bus. The remaining five Spectras seem to be the five that were expected to be ordered in January 2002 for the town fleet. There has been some speculation as to whether or not the first nine buses will be able to arrive on time for the new services which start on 25th November, indeed I have been told that three of the existing Spectras may be temporarily repainted to cover. The NightTrack/DayTrack buses will be the first in Reading to have new Wayfarer TGX 150 ticket machines fitted, whilst the Newbury operation is already using them, the Reading fleet is due to receive them by the end of the year. Also on order are three new Optare Solos for the Newbury fleet. Two of these will be used to operate service 131 which the company recently won from Weavaway. Thanks to Mac Head and Paul Hilton for this information. 601 KX51 CRU "Route 66"
602 KX51 CRV "Route 66"
603 KX51 CRZ "Route 66"
604 KX51 CSF "Route 66"
605 KX51 CSO "Route 66"
606 KX51 CSU "Route 66"
607 KX51 CSV "Route 66"
608 KX51 CSY "Route 66"
609 KX51 CSZ "Route 66"
610 KX51 CTE "Route 66"
Thanks to Keith Wood for this information. Today saw the official launch of the fifteen new Optare Solos for Stagecoach in Warwickshire's Leamington depot. Solos 604, 601 and 603 were parked up outside the town hall (in that order) by 11.00am ready for a quick ceremony about 10 minutes before midday. There were a number of drivers on hand to help promote the buses and to show members of the public around, pointing out the low floors and wheelchair ramps. 604 had two red ribbons wrapped around it which were cut by the mayor after a few words and then it took an official party on a brief ride around the town. All three Solos were showing promotional destinations - the front flashed: Stagecoach / route 66 / Warwick to Whitnash via Leamington / NEW! easy access buses / from 1st October 2001. The side displays flashed: Welcome aboard / another brand new / all singing / all dancing / easy access / low floor bus / for route 66. When I briefly checked back twenty minutes later, 601 was outside the town hall, and I noted 604 a minute later heading in that directions still with officials on board. Special bus stops have been put up in the town centre with a side view of one of the Solos and other adverts for the route. Very attractive temporary notices in the new corporate Stagecoach style were also attached below the timetable stating that new easy access buses would be operating the route from 1st October 2001. Reading Buses have won the contract to operate the new night bus network in Reading. A network of nine hourly night time services are to be operated from 25th November along with a daytime service to Green Park. The night time services are to be branded nighttrack and daytrack with buses wearing the branding "nighttrack - regular night services from town centre / daytrack - every 7-8 minutes Station to Green Park". New low floor Optare Spectra double deckers are expected to be used on the service in a special NightTrack/DayTrack livery, and 25 drivers will need to be recruited. NightTrack will operate every hour to nine different areas of the town 8pm-2am Sunday-Wednesday and 8pm-4am Thursday-Saturday. DayTrack will operate to Green Park via the Madjeski Park 'n' Ride site 7.00am-6.45pm. Reading Buses won the contract tendering the lowest bid of �6,599,000 over five years, with Go-Ahead bidding �8,165,000 and First Beeline �9,685,850. Reading Buses had the advantage that they are only operator with a depot in the town so did not have the extra costs associated with that, but they also offered extras such as onboard CCTV and the introduction of off-bus ticketing to help to prevent crime. Reading Buses are, of course owned by the council, so when the decision was made an independent firm was brought in to make sure that everything was in order and that they had won the service based on the merits of their bid alone. Nothing has yet been said about the future of the existing Madjeski Stadium / Green Park park and ride service that is tendered by the council and operated by First Beeline. Pete's Travel have won the contract to operate the 43A service that runs once a day to the University from 22nd October. Previously Travel West Midlands operated the route, and it means that students buying TWM bus passes will have to pay 40p each time they want to use this service, but normal single fares are likely to remain the same. The service links the University with areas not covered by the main number 12 bus route. To finish the university bus news on a positive note, brand new Dennis Trident easy access low floor double deckers are being introduced onto the number 12 route, with more to be delivered before the start of term. Pete's Travel have also won some other contracts in Coventry, the 43/A, the 44, the 48 (Walsgrave Hospital), and the 64 (Stivichall). They have also been operating the Sunday 75/7 service. It is likely that Carlyle Dartline bodied Mercedes Benz Varios will be used on most of the routes, including the 43/A, but low floor buses will be used on one, most likely the 48. All of the new contracts start on the 22nd October. Information will appear on their website www.petestravel.co.uk in due course. Countywide Travel have taken over Tillingbourne's old number 12 route to Aldershot after it was abruptly stopped in March when Tillingbourne went into liquidation. The new route has been renumbered the 72 to remove the old clash with the Reading Buses route of the same number and seems to have started on the 3rd. I noted my first vehicle of theirs today, it was a Mercedes Benz minibus, but as yet I have no further details. 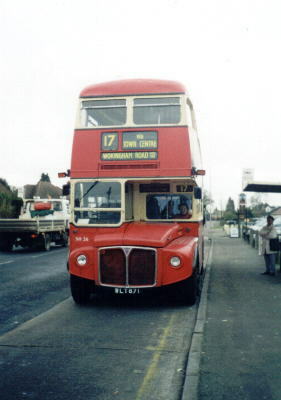 The 72 is believed to be the company's first route in the town, the company is based in Basingstoke. great confusion amongst passengers. There were quite long queues on Friar Street for all the buses not stopping there, and there was even a small queue on Minster Street for a time this afternoon!!! Unbelievable! The complete lack of traffic and big metal railings only a couple of metres away and people still stayed there as if nothing was going on! Cheapside was much quieter than I expected, most passengers I think went to catch their bus at the station. The whole road had cones and temporary no parking/stopping signs along its entire length. There was nothing on stop CZ to indicate that the buses were being diverted to stop there, and so the few passengers waiting there looked very uncertain whether they were waiting at the right place, and were relieved when their bus pulled up. All of the normal stops had white pieces of paper advising passengers to use stop CZ, but they largely went unread. Services 1, 1A diverted via Bridge Street (use stop MI) to St.Mary's Butts, omitting Duke Street. Services 5, 6, 12, 20, 41 diverted via Crown Street, Southampton Street, Bridge Street (use stop MI) to St. Marys Butts, omitting London Street and Duke Street. Service 17 diverted via Forbury Road (use stop SX), Station Hill, IDR, Castle Street to St Marys Butts, omitting Kings Road. Service 18, 36, 37, 38 diverted via U-turn from the Station, IDR, Castle Street to St. Marys Butts. Services 21, 25, 28, 30, 31, 33, 34, 45 (to Calcot), 101, 102, 143, 148, 149 diverted via Station Hill, IDR slip, Cheapside (use stop CZ), Russel Street, omitting Friar Street and Castle Street. Services 30, 33, 34 also omit the Russel Street/Tilehurst Road stop, use service 31 stop in Russel Street instead. Services 63, 65, 125, 126, 127, 128 diverted via Forbury Road to Station Hill (drop of at stop SX), omitting Kings Road and St. Marys Butts. Services 190/191/192/193 diverted via Queens Road, IDR, Castle Street to St. Mary's Butts, omitting Kings Road. Service 500 Showcase Cinema Fasttrack diverted via Queens Road, IDR, Castle Street to St. Mary's Butts, omitting Kings Road. Service 501 Madejski Stadium Fasttrack diverted via IDR, Castle Street to St. Mary's Butts, omitting Duke Street. Services 21, 25, 28, 34, 44 (from Calcot), 101, 102, 143, 148, 149 diverted from Castle Hill via IDR to Friar Street between 9am and 2pm on Saturdays, omitting Castle Street and St. Marys Butts. This is to avoid the expected congestion in Castle Street during this period. All these diversions should bring chaos to the town on Saturday. All buses that run up Castle Hill will instead be using Cheapside, Oxford Road and Russel Street and are in my opinion likely to cause some considerable extra congestion. I also think the Buses will end up running very late throughout the day due to the extra time it will take them to traverse these diversions. One stop to avoid at all costs for the passenger will be CZ in Cheapside - all of the passengers for the Fords Farm, Calcot, Bath Road and Tilehurst Road services from Minster Street and Friar Street will be there, on average a bus will be scheduled to leave there every 4 minutes amongst all of the usual traffic. Just think how long the queue usually is for the Fords Farm buses on Minster Street and add all the other queues you usually see on the road to it, then add al the queues you would see if you were on Friar Street and you get stop CZ this weekend! These weekends will be good days for enthusiasts with so many buses operating along unusual roads. The first of the new Solos was on show to customers on the Parade in Leamington on Saturday 1st. Fifteen in total are to be operated in the town on the 66 / 75 / 76 services between Leamington and Warwick. Also Olympian 918 has been repainted into the new livery. Thanks to Keith Wood for this. Newbury Buses have won the contract to operate services 130/134 to Chieveley, Ilsley, Compton and Hermitage from Weavaway Travel. Weavaway will be giving the service up with immediate effect, and Newbury Buses will be providing a replacement service numbered 131 from tomorrow. The service may be revised again in late October / early November when the contract was due to start, and it is expected that a Solo will be transferred from Reading to operate it. In fact a new Solo has been ordered (07-09-01). Reading's old London buses are back in London! Former Reading Mainline No.12 (RM45 / AST 415A) has emerged from it's extensive refurbishment at Marshall's and has entered service London's Sovereign's route 13. To my knowledge the only other from Mainline so far has been No.23 (RM23 / JFO 256), and it is expected that No. 35 (RM1640 / 640 DYE), No. 40 (RM848 / WLT 848) and others should be ready to join them soon. Routemasters from other sources new to the route include RM121 (SSL 806), RM324 (WLT 324), RM441 (LDS 341A), RM1005 (ALC 290A), RM1204 (204 CLT), RM1218 (218 CLT), RM1933 (ALD 933B). Over 30 RMs have been acquired by Transport for London to go back on the streets of London, the first route to benefit being the 13, the longer Routemasters that it currently uses are going on to convert driver operated routes which need their larger capacity. There are reports that new VanHool Alizee 242, which usually operates a night time service from Reading to Gatwick Airport, has had its front extensively damaged. Although this has not yet been confirmed, it is said that a parking Optare Excel caught the coach's wing mirror, and used it to rip off a large section of the front of the coach. It is also said that the damage was so bad that the coach has had to go back to VanHool for repairs. In the past Excels have caused damage to other vehicles in the garage whilst reversing because at least half do not have rear windows. Surprise bus news in Reading is that former Cardiff Excels 946-8 have been put into store. 949 was also originally with them, but was put back into service when one of Reading's native Excels needed attention after it blew it's engine. 946-8 join Mk 1 and Mk 2 Optare MetroRiders from Reading and Newbury in the back corner of the depot. Newbury MetroRider 621, which is part of this reserve fleet has been in use on route familiarisation duties for drivers. Another Cardiff Excel, 960 has had new dot matrix destination equipment fitted. The new equipment is bright red and is very much easier to read than the previous equipment because it is so much brighter. See picture. Optare Solo 101 has had all of it's Hoppa branding removed since the Hoppa service was withdrawn at the end of last month. It is now operating normal Solo duties without any vinyl's apart from small Reading Buses logos at the rear of the bus, which were part of the Hoppa livery and are part of the standard SoloRider livery. See picture. Newbury Buses are withdrawing services 119, 155 and 156 to Marlborough from the end of August. The routes are not being very well used, council sponsorship for the route has dried up and I am told that Wilts & Dorset had started competing on sections of the route outside Newbury, with their buses running just a few minutes ahead of the Newbury bus. Thames Travel are due to take over Stagecoach Oxford's service 105 from Oxford to Wallingford from 4th September, and it seems that a couple of Dennis darts with Marshal bodywork are coming from The Oxford Bus Company to operate it, but it is unclear if they are acquisitions or are on loan. Details will appear on my fleet list as I get them. In Coventry, Travel West Midlands have been putting new Dennis Trident / Alexander ALX400 low floor double deckers into service, these being the first low floor deckers in the town. I'm told they are primarily for use on service 36, but they will also appear on a few other routes as they arrive over the coming weeks. Control of Stagecoach Midland Red's Banbury depot is being transferred to Stagecoach Oxford in November. The move seems sensible because Banbury is much further from Midland Red's base in Rugby than it is from Oxford. This also means that the entire Midland Red fleet is branded Stagecoach in Warwickshire, Oxford getting control of the Stagecoach in Banbury brand. Details of bus services in Banbury are already included on the Stagecoach in Oxford website. To the best of my knowledge, these are the Midland Red buses that have been repainted into the new corporate livery to date: 203, 205, 210, 211, 212, 214, 215, 216, 219, 220, 225, 226, 228, 229, 233, 238, 242, 246, 342, 347, 349, 359, 457, 465, 856, 857, 915. Some of Stagecoach's first ever brand new Optare vehicles are due for the Warwickshire fleet. The first will be Optare Solos, fleet numbers 601-3 and will have the new style registrations KX51 CRU, KX51 CRV, KX51 CRZ. Details are also on my new fleet list for the operator. Monday 15th August 2001 saw the opening of new bus lanes on Station Hill in Reading. Essentially normal traffic is no longer permitted along the road, but there are special markings to allow deliveries and for people to picked up. The main carriageway up the hill has become a full time bus lane, as has a small stretch from the turning from the taxi rank to the roundabout in the downhill direction. Vehicles using the road for loading and to drop people off are now limited to the route they may use. They are allowed up the lane which includes the taxi rank, and then only to turn right from there to access the shops. No traffic apart from buses and taxis is allowed over the busy crossing in either direction, keeping this it free from dangerous congestion. These new measures will be enforced by CCTV cameras placed near to the pedestrian crossing to catch offending vehicles in both directions. The top end of Gerard Street has also been blocked to traffic to make the junction safer for pedestrians, the road has been made two way instead. Pedestrian access to the Station is now much safer. The other piece of news is that Newbury Buses will for the first time be operating a special football service, to Reading! The service will give RFC football fans in Newbury, Woolhampton, Theale, Calcot and on the Bath Road a direct service to the Madejski Stadium, and augments services that are already operated by Reading Buses from other areas of Reading. I am happy to announce the launch of Bus Zone the new name for this site! The site can now be accessed from www.buszone.co.uk whilst the old site reached the 5000 visitor mark in July 2001. The new URL simply links to the old site, so any links you have will work as before. The main change to the site is that buses now form the main focus, Reading remains at the heart of this with regular updates and some new sections on the way. There are more details about operators in the Midlands and a new Oxfordshire section to fill in the gap between Reading and the Midlands. Oxfordshire provides an interesting area of the country to look at, Oxford itself being one of only five places in the UK that operator Stagecoach experienced a growth in passenger numbers during 2000/1. Services in Reading were revised from Monday 30th July 2001. The changes this time seem sensible, with provision in some areas being greatly improved, some previously lost daytime links have been restored, but services in other areas have been reduced, but only by a small amount and in areas where frequencies allow it to happen without a great inconvenience to passengers. The changes had the greatest effect on services 10/21/23/24/25/44/45 with the main aim being to simplify the way the service is provided. This was mainly done using services 44/45 which now operate every 20 minutes across the whole of their route (Calcot to Coley Park through Caversham) all day, and less frequently during the Evenings and Sundays. Consequently services 23 and 24 were withdrawn, the 10 cut to operate only from Earley to Town and the 21 cut to every hour, and only as far as Fords Farm. The 25's route was altered slightly to replace parts of the 21 route, and also operates every 20 minutes, meaning that the service to Calcot is increased from every 15 minutes to every 10. Frequencies in other areas were slightly reduced, the frequency on service 17 went from every 7/8 minutes to every 8 minutes and the combined service along Tilehurst Road down to every 7/8 minutes. Service 40 was withdrawn, journeys being replaced by buses on the usual daytime routes (41, 44/45), and the council withdrew the Town Centre Hoppa service. The withdrawal of the Hoppa came as a surprise, even though it was rarely used by passengers, because there was no notice to passengers about it going. Nothing was included on the company's information leaflet or website, but then the route has never been included in any of the company's service guides, presumably because it is a council contract. Full details are on my Reading Area Bus Routes Page. Reading Buses are introducing a new Zonal Bus Fare system from 11th June 2001. The town is split up into a number of zones, and bus fares are calculated depending on the number of zones you travel through. The new system simplifies the fares system in the town, and is much easier to advertise and understand. Full details are on my new Reading Buses Fares page. Another new page has been added with details about Goldline's new Autobus Nouvelle 2 midicoach, and my Optare page has been updated. Major route changes in the Newbury area commence from 30th April 2001. They will see the end of the N prefixes on all services, and whilst some routes are simply re-numbered other have major changes. One or two infrequent services are to disappear whilst some areas gain services for the first time. See my Local Bus Routes page for all of the details on all Newbury services. Newbury Buses say that the changes are to reflect changes in demand and to achieve some savings. Goldline are starting a new night-time service from this date in conjunction with Thames Trains. The service connects Reading to Gatwick Airport using brand new high-spec coaches which have Goldline and Thames Trains logos. Thames Travel are also making a couple of changes to their services, the 144, taken over from Tillingbourne returns to a full timetable and the 132 extension from Pangbourne is changed to Reading Town Centre via Purley and Oxford Road rather than Calcot SavaCentre so give drivers on the 144 a link to the Thames Travel depot. Tillingbourne went into administrative receivership on 19th March 2001. The administrators suspended trading by the company, leaving services on the evening on the 19th severely disrupted. Negotiations to sell the company had fallen through, with reports saying that the company had been loosing �30,000 per month. The local councils have been left to arrange alternative services, requiring a peak of 50 vehicles (the fleet consisting of over 70 vehicles) as best they could, different operators stepping in to help in different areas, although not immediately. Companies filling the gaps include Arriva, Compass Travel, who have both taken on a number of routes, White Rose, Stagecoach Hants & Surrey. Arriva and Stagecoach were able to transfer buses from other fleets almost immediately to help cover the routes that they had taken on, but for Stagecoach staffing was more of a problem, which meant that they could only take on a single route. Other companies have simply used engineering spares, with some companies saying that they have a few extra buses on the way to help out. Apparently Reading Buses, itself currently very short on drivers and running an emergency timetable, has also helped a little, from what I can gather mainly on the 19th after Tillingbourne's fleet was called back to the depot, and presumably on the Reading area routes. It is not yet known what will eventually happen to all of the routes, however all of the companies staff have been made redundant and the company's assets look to be for sale. Reading Buses has announced that it is re-instating the off-peak journeys on services 111 and 112 which it withdrew in November 2000 from 26th March 2001. These services cover part of Tillingbourne's former number 12 route and were originally withdrawn due the company's driver shortage. Thames Travel started operating a skeleton service on the 144 on the same day for two weeks, and another two weeks after that, and has been extended again for another five months. By very popular demand (haha) I have added a couple of photos of myself (on buses of course) to the My Life section. Also recently added are pages about Reading Buses Depots & Service 17, Reading Transport MCW Metropolitans and Aldermaston Coaches. I have now added some content to my Coventry area page, and more is to come. Various other sections have been updated including all fleet lists and the Reading bus route guide. In February 2001 Reading Buses launched two minibuses powered by liquefied petroleum gas. They are to operate in Reading on both urban and interurban routes. Using natural gas rather than diesel is better for the environment because it produces far fewer emissions, even compared to low-sulphur diesel which Reading Buses use. The two buses aren't actually new to the company but have been transferred from Newbury Buses, where they operated for about four years. The trials at Newbury were neither particularly successful or unsuccessful. The buses did help to cut emissions and the environment, but they were difficult to re-fuel. The Newbury depot was only equipped with slow-fill gas stations, meaning that it took at long time to re-fuel the buses, and therefore they were rarely able to operate a full days service. The two buses concerned are Mk2 Optare MetroRiders, fleet numbers 614 and 624. 614 had it's engine replaced whilst in Newbury, it was fitted with a different type of engine to 624 and was the first of the two gas buses to enter service there, 624 arriving quite a number of months after 614. 614's engine proved to be troublesome, so a different engine was specified for 624, and after operating 624 for a while it was decided to change 614 to match. Then upon transfer to Reading it appears that they were modified to run on LNG - liquefied natural gas. Just a quick note that as of March 2001 I am ending the use of www.robert-williams.co.uk as an alternative address to this website. I haven't kept the alternative domain up to date with the changes made to this one over the last year, and so the other one has become redundant. As far as I know very few people use this address, so just keep on visiting me at www.busweb.co.uk/rwill2805/ - I look forward to seeing over 4000 hits on my counter in the near future! Last Optare StarRider withdrawn from Newbury Buses! On 5th December 2000 Optare StarRiders operated for the last time in Newbury. This event is all the more significant because these buses are the last of the vehicles that were purchased in 1994 when Reading Transport took over The BeeLine's Reading and Newbury operations. In the six years that Reading Transport has operated these services it has replaced the entire fleet that runs them! Not only this, but it has also purchased and replaced a fleet of 40 Routemasters and continued it's usual fleet replacement scheme for the rest of it's Reading fleet. In their time the StarRiders became what you might consider a standard Newbury minibus. They operated on most of the town's services and were used to launch the Newbury Buses livery when Reading Transport took over from the BeeLine. 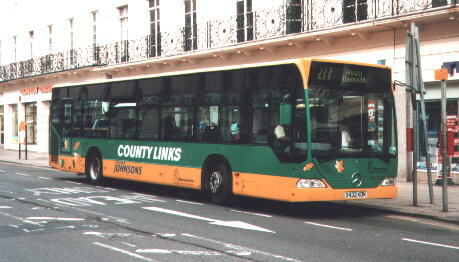 The fleet of 10 was halved in the summer of 1999 when newer minibuses were transferred in from Reading Buses, and the remaining five were re-furbished. It was expected then that they would see a few more years service with the company, but as it turned out, they barely lasted a year! The last five were replaced by four larger Optare Vecta midibuses from the Reading Buses fleet, Newbury now having 14 of this type, and Reading none. Reading had already operated two StarRiders before the Newbury ones came into the fleet. They operated in Goldrider livery along with former MCW Metroriders 601-6, but did not stay in the fleet very long, being withdrawn in 1991. The Go-Ahead Group plc ("Go-Ahead") today announced the sale of WBC, its bus operations in High Wycombe, to Arriva the Shires Limited, a subsidiary of Arriva plc, for a total consideration of �5 million payable in cash. The Wycombe Bus Company, which operates 52 vehicles and employs 110 staff, was first acquired by Go-Ahead in March 1994 at the time of its acquisition of the Oxford Bus Company. Since acquisition much work has been undertaken to improve the quality of bus services in the area and during that period the patronage of High Wycombe bus services has grown by 21%. At the same time the quality of the bus fleet has been improved significantly with fully accessible low floor vehicles introduced to a key town service in 1996. However, despite the continuing efforts of Go-Ahead and the staff of Wycombe Bus Company, profit margins have not developed sufficiently to permit a long-term fleet replacement programme. Following the compulsory purchase order imposed on the company's depot and bus station as part of the town centre redevelopment, it became clear that the only alternative site likely to be made available for relocation was situated adjacent to the existing Arriva bus garage in the town. It therefore made sense to dispose of the business and allow Arriva the opportunity to develop a fully integrated service network for High Wycombe. Emergency Bus Service Changes in Reading! Reading Buses have made changes to most of their minibus routes in attempt to improve the overall reliability of their services. The company is suffering from a continuing shortage of some 40 drivers (said to be about 15% of their driver requirement), and up until now it has had to do its best to make up for the driver shortfall by arranging overtime with the drivers. Of course with such a large shortage it hasn't been possible to cover the whole timetable, and the reliability of services has dropped significantly. The company has had this problem for a long while, well before Reading Mainline's Routemasters had their last day in July. During the final weeks Mainline crews operated more and more frequently Reading Buses routes, in fact on one Sunday afternoon occasion crew operating a significant part of the network. The end of Mainline saw conductors and Mainline drivers continue on service 21 (and when needed elsewhere) for a few months whilst the conductors were given the opportunity to train as drivers. The service changes made in connection with the end of Reading Mainline were designed to reduce the number of drivers required as well. It was hoped at the time that all of this would help to ease the driver problem, but it turns out not to have been enough. So Reading Buses are reducing the frequencies on most of their mini-bus routes, and altering some routes so that fewer buses are required. This will free up 13 drivers for use on the "big bus" routes, and it is hoped that this will be enough to allow the company to get the reliability of their services back up to an acceptable level. The company says that it will review the situation in the Spring, and hopes to be able to reinstate most of the lost journeys. There is some good news for customers, to make up for these reductions, as a token of recompense to customers that have purchased monthly or quarterly TravelCards in expectation of a higher level of service following the 20th November, the first renewal of any such card will be available at the prices which applied before they put the fares up in October. See my Local Bus Routes page for exact details about the services which have been changed. In general, Services 1, 1A, 13, 27 are reduced to hourly, with 1A being diverted via Elvaston Way in order to replace part of service 27, and a section of 13 between Cressingham Road and Lower Earley being withdrawn. Service 29 is withdrawn - the service between the town centre and Amersham Road becoming hourly. Service 20 between the town centre and Lower Earley are now to be hourly in the mid-day off peak period on Monday to Friday and all day Saturday, and the 10.10am, 11.10am. 12.10pm and 1.10pm Monday to Saturday journeys between Reading and Spencers Wood on the services 111/112 will be withdrawn. A small number of journeys on services 7, 25 and 34 are also withdrawn. I will be moving to Warwick University on 30th September 2000 to start my Physics degree. I am hoping to be able to continue updating this site whilst I am there. Now my A-levels have finished I have had a bit of time to work on the website. I have made a number of additions, and the former Educational and Useful Items sections have been amalgamated into the new My Life section, and you may have already noticed the groovy calendar that I have added to this page. I have swapped about my email addresses again, my main contact address now being robert@buszone.zzn.com, or webmaster@buszone.zzn.com for queries and comments about this site. The 22nd July 2000 saw the final withdrawal of Reading Mainline Routemaster buses from Reading. Extra buses were run on lines D and F, bringing the whole of the remaining operational fleet out onto the roads for the whole day. In total the usual 7 and an extra 4 buses were run. Nos. 25, 43, 36 and 24 operated Line F, Nos. 11, 42 and 23 operated Line D, Nos. 14 and 18 operated extra Line Fs and Nos. 19 and 20 operated extra Line Ds. No.19 and 42 were swapped at 1pm because No.42 had developed a fuel leak, so No. 19 was taken from the extra and put onto the normal service. No. 42 was taken back to the depot for repair, and re-entered service on the Extra about an hour later. All of the buses had special via blinds advertising the last day, special cards over the bonnet which had been up all week and wreaths on the front grille. Black ribbon was also tied around the buses in various places. The last bus into the depot was No. 36. It was driven by Mike Russell, the founder of Reading Mainline and had a special blinds on the rear with the destination THE END. There were a vast number of photographers in the town, the most I have ever seen. They took their final rides on the buses, and some came to the depot later on to see the last bus in. Line D is being replaced by new service 31, a lot of journeys will be cut back in the style of Line E, and some will still go through to Purley. Optare Excels - LowRiders - will be used on this route. Line F is being replaced by service 21, to be conductor operated on Metrobuses - normal Reading deckers - until October. Buses with conductors on board have special boards in the front window of the bus. 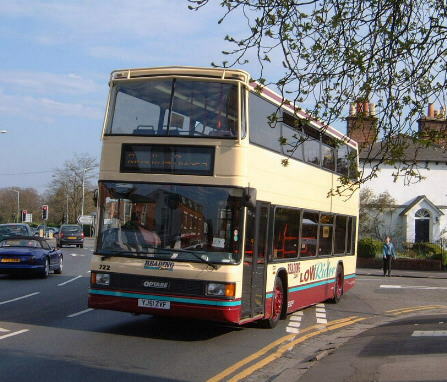 On 23rd February 2000 Reading Mainline Routemaster No.26 operated Reading Buses route 17. It occurred because Reading Buses had found itself 20 drivers short, and Mainline had a crew and bus spare. However the union intervened, so now in the future if a Mainline crew goes on a Reading Buses route, a standard Reading Bus has to be used. So this means that it looks to have been a 'one off' event! Thankfully some enthusiasts were on hand to record the event, and I have a photograph of the event courtesy of Tim Wale of the bus at the Tilehurst Bear Inn terminus that you can view here. On Sunday 7th May 2000 Reading Transport's London coach service is to be scrapped because the service is no longer viable. This year it is forecast to make an operating loss of �100,000 alone whilst passenger number have fallen virtually every year since the service was started nearly 20 years ago. Visit www.reading-buses.co.uk for more details. The 19th February 2000 saw the withdrawal of Reading Mainline line A. There were many photographers out in the town, and I had the opportunity to conduct on the route on that morning. Line A was the first route operated by the company, and is being replaced by Optare Solos - "SoloRiders" that will double the frequency of route 1 on alternative route 1A. The manager and founder of Reading Mainline drove the last A into the depot at about 19:00 that evening. My New Job - A Bus Conductor! At the end of August 1999 I am pleased to say that I became a conductor for Reading Mainline! Reading Mainline is part of Reading Transport and operates a fleet of about 24 Routemaster buses around the town. As an employee I must make clear that this site is not linked in any way to the company, it is not an official site, but simply an enthusiast site. I have moved the official address of my website from FreeZ, who now place large adverts on my pages, to Busweb. The new address will be: www.busweb.co.uk/rwill2805/. I am keeping the old FreeZ site online as a mirror site for the main site, but as time goes on you may start to find that it is not kept quite as up to date as this new address. I have received a number of reports saying that people found my old news page hard to read, so here is a brand new version, based on the colours used on the rest of my site. Along with this update I have produced a fleet list of every single Bus, Tram and Trolleybus operated by Reading Transport since it was formed in 1901. Its took quite a few hours of hard work, so I hope that you will have a look. If there are any questions or corrections, please contact me! I celebrated my 1000th visitor in July 1999, and 1100th in August 1999 quite an achievement for my site I think! It has long been my intent to pay a visit to Newbury to photograph some of their buses. Finally in July I got around to getting up and going. The results should show up on the site soon, but I'd thought that I would just say a little about my impressions of the town. From the train station I has no idea which way to turn, but the brand new Vodaphone shuttle buses helped me out. I figured that eventually they must go to the Bus Station, so I walked in the direction of the first one I saw, and went looking for sign posts. I found some, and then quickly found my way to the bus station. Reading doesn't have an operational bus station anymore, but compared to others I have seen, I was impressed by the corporate 'Newbury Buses' style that had been applied to all of the stands in Newbury. Each stand had up to date, colourful timetables, and all route numbers were clearly marked. All the buses I could see were in full Newbury Buses livery, along with the odd Bennetts Coach and Stagecoach bus, but they are not owned by Reading Transport. There was one exception to all this, an Optare MetroRider very recently transferred from Reading. It did not have Newbury Buses written on the side, and so only had half a stripe. It made me wonder whether the company had run out with all buses transferred recently. Most of the destination blinds on the buses were accurate too, although a few were not up to scratch. Interestingly these were the vehicle that have served Newbury the longest, not the ones recently sent to Newbury. I managed to get a number of photographs on during the trip. I was able to photograph a couple of Newbury Buses on the 101 and 102 at Reading Station before setting off on the train, and then I photographed them again once I got to Newbury. I managed to get pictures of most of other buses operating that day as well, but what was annoying however was some of them made their way to Reading for me to photograph when I got back! Anyway it was well spent afternoon. Newbury's Leyland Nationals are set to have left Newbury by the end of July 1999. Currently there are only two left, the others have been replaced by Optare Vectas and MK I MCW Metrobuses handed down from Reading Buses. Some of the vehicles have served Newbury for almost 25 years under a number of different operators. 333 was new in 1978 and operated under the Thames Valley & Aldershot Omnibus Co Ltd, Alder Valley North Ltd, The Bee Line and finally Newbury Buses. 333 has spent nearly 25 years in Newbury, but sadly attempts to purchase it for preservation failed. It has taken only two months from 300 hits, but I have passed the 600 hits marker (May 99). I thought that I would inform you of what I have in mind for this site over the next few months. I have just finished changing the keyboard section to the music section. Like I have done with the Buses and Sci-Fi sections I have split it into separate pages on different items. The choir will once again have a mention on Rob's main website, but the choir's homepage is still separate. I may think of some more sections to go in the music section at some stage, which will add to the fun. I am also in the process of trying to speed up the loading time of my front page, and any comments about that would be appreciated. I am pleased now to see that I have passed to 300 visitor threshold on my webcounter (Mar 99). Thanks, for you support and keep on visiting! The numbers already are beyond my wildest dreams. I have now created a new Buses section on the site for all of my existing bus pages to come under, along with a couple of new pages I have made. I hope you enjoy it! I now also have got myself some extra web storage space, so over the next few weeks you should see lots more exciting pictures and sounds being added! On 29th of December 1998, I had the chance to visit the Reading Buses depot to talk with the managing director, Colin Thompson about careers in the bus industry. With a degree in electronic engineering in my mind, I was shown how the company uses electronics. First of all I was shown how a small blue box, the size of a credit card is placed over the doors on all of the buses in the fleet. These boxes can be detected by special cameras, which are being installed around the town. Currently there are not that many cameras, but one of the front gates of the depot allows the company to monitor buses entering and exiting the depot. Also the cameras are used to give buses priority at traffic lights they are installed on. The lights will either change to green in time for the bus, or stay on green for longer, until the bus has passed. This saves the buses vital minutes, which all add up on the course of a long bus route. Electronics are also used inside buses. The most modern buses in the fleet can be plugged in to a special box, which then gets the bus to tell the engineer what is wrong with it! Some buses now can also give a guide on how to fix the problem! Ticket machines can be used to set automatically the destination blinds on the bus, meaning that the driver does not have to move to change side and rear blinds, as well as the front ones. Other schemes that have been tried have been deemed too unreliable. First, there is a real time bus information system, which was installed on one route, the 17. The system really needed information about all routes that serve the bus stop to be of use to the passenger. The system might say that there would be a number 17 bus in 5 minutes, but one with a different route number could be only a few seconds away. Recently the prepaid "Transcard" fare paying system has been discontinued. It was designed to speed boarding times, reduce the amount of money passengers, and bus driver had to carry, and to be a convenient way to pay for bus travel. The devices have become unreliable, and also increased boarding times. This was because time had to be spent inserting the card, getting the machine to actually accept the card, and there was the usual ticket issuing time on top of that. It is hoped that in a few years a SMART card system could be introduced, which would mean that all you would have to do is touch the card on the machine to take the fare from it. On 31st October 1998 an ex-Reading Transport Trolleybus No. 113 came into Reading Town Centre to mark the 30th anniversary of the sad demise of Trolleybuses in the town and the final Trolleybus journey on 3rd November 1968. Later at 7:00pm in Reading's Abbey Gateway there was a slide show of Reading Trolleybuses. The latest booklet to commemorate the 30th anniversary was available on the bus during the day and at the Abbey Gateway in the Evening. It was great to see the Trolleybus once again in the town, but public attention was not what it would have been if it had stopped raining at some point during the day! Also the bus was slightly crowded by some vehicles pulling up bus shelters on the other side of the road. The book was a good read for only �2, and I liked having the opportunity to take a picture of such an old vehicle. In May 1999 Reading 113 will be going into service under it's own power at the Sandtoft Transport Museum - it's 60th birthday.